I’ve been getting a lot of questions about the Roland RP-102 lately, so I figure it’s about time to do a full review of this lovely digital piano. Roland doesn’t have that many entry-level digital pianos and mainly known for professional grade instruments that cost well over $1000. I’m glad that Roland continues to expand its product range and release some beginner-friendly options as well. 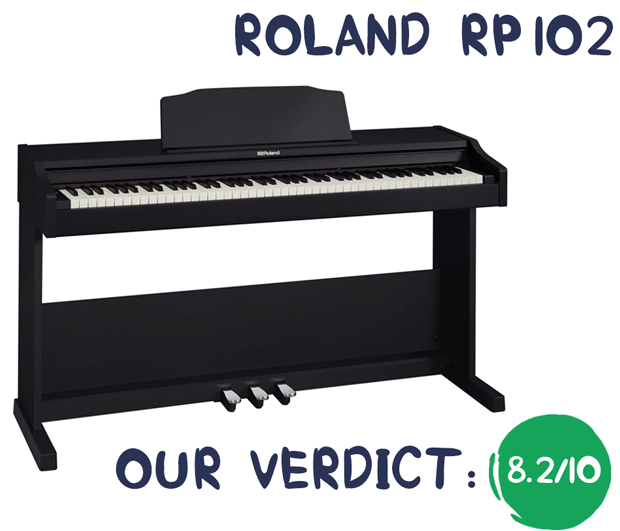 After its release in late 2017, the RP-102 has become the most affordable console digital piano in Roland’s arsenal. 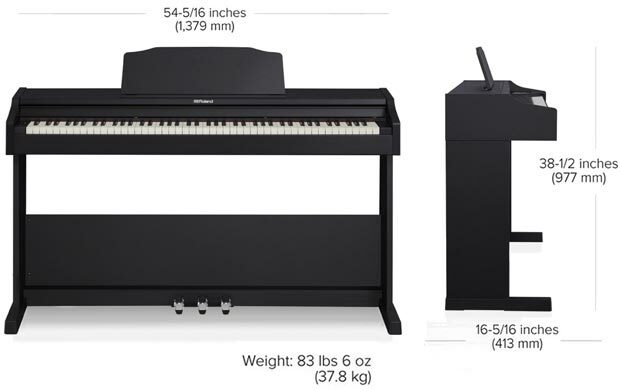 With its sub-$1000 price tag the RP-102 enters quite a competitive segment of the market where there’re a lot of good digital pianos available from other notable brands like Yamaha, Casio, etc. 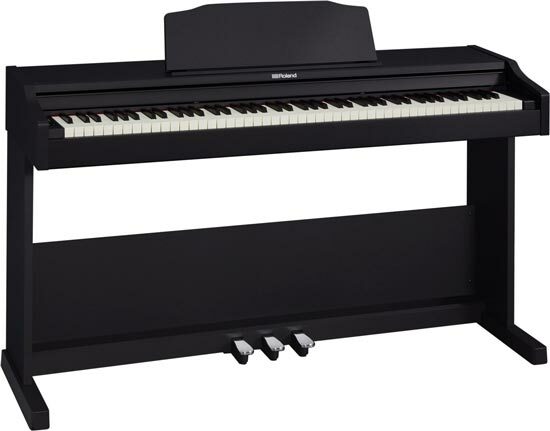 Knowing that Roland has packed some pretty cool technology into the RP-102, making it a highly-competitive piano in its price range for sure. The Roland RP-102 is among our 5 favorite digital pianos under $1000 available on the market today. If we’re talking about console digital pianos they usually come in two styles. 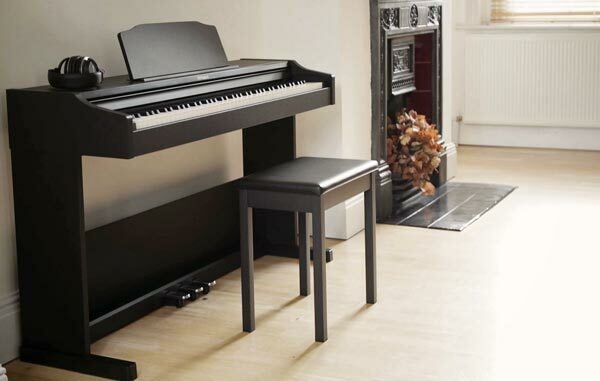 “Contemporary cabinet” digital pianos are quite slim/compact and are designed to take up as little space as possible. They don’t attempt to mimic the look of an acoustic piano. “Traditional cabinet” digital pianos are usually not as compact and better resemble the look of a real acoustic instrument. Generally, the higher the price, the fancier and more acoustic-like the cabinet looks. The RP-102 is considered to have a traditional style cabinet. Compared to the Casio PX-870 or the Roland F-140R, which have a modern cabinet design, the RP-102 is only a few inches deeper, and have a more traditional vibe to its appearance. Ultimately, it all comes down to which design works the best for you and your home interior. The thing I like about the RP102 is that it looks very clean and minimalistic. There’re barely any extraneous elements, which I’m sure many players will appreciate. The build quality is great as expected from Roland. The side panels and legs are quite thick and feel very sturdy. Keep in mind that the piano is quite heavy (83 lbs), so you’d better have someone to help you unbox and assemble it. The assembly is nothing complicated and won’t take more than 30-40 minutes. 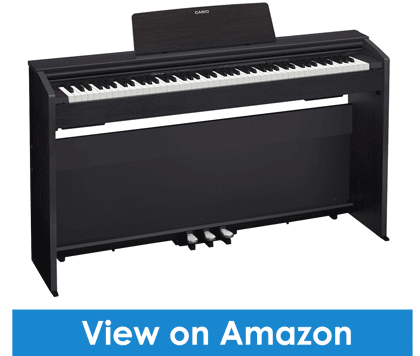 There’re 6 pieces (main keyboard unit, side boards, rear board, pedal unit, music rest) that you’ll need to put together using a Phillips screwdriver and a screw set that comes with the piano. 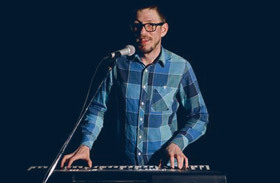 The pedal board includes 3 piano-style pedals that are made of metal and replicate the feel of real acoustic piano pedals (Sustain, Soft, Sostenuto). All three pedals support half-pedal operation, which will allow you to master your pedaling technique and play more advanced pieces. 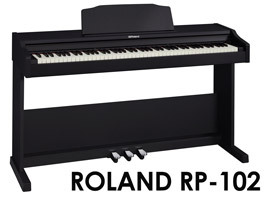 The Roland RP102 is only available in black finish, which is the most popular color anyway, so Roland didn’t bother to offer any other color options. When it comes to controls, the RP-102 is very straightforward. There’re only 4 buttons located on the left of the piano. From the aesthetic/design perspective, it’s definitely a good thing. But having fewer buttons also means that it’s not as easy to get to settings and sounds very quickly. Luckily, the RP-102 is pretty light on features, so it shouldn’t be a problem. There are a Power button, two volume buttons, and a Function button. All settings, functions, and sounds of the instrument can be accessed by pressing the “Function” button with one of the piano keys. There aren’t any labels under the keys, so initially you’ll have to refer to the manual to see which keys need to be pressed to access a certain parameter. The great thing is that you can use Roland’s free app on your mobile devices to control the functions of the RP-102 and do many other cool things (more in the ‘Connectivity’ section). The PHA-4 Standard is the keyboard you’ll find in the RP-102 and some other entry-level digital pianos from Roland. However, I wouldn’t call the action a basic one; it’s actually one of the most realistic keyboard actions you can get at this price point. The RP-102 has 88 fully-weighted keys that utilize gradually weighted hammer system designed to reproduce the feel of an acoustic piano action. 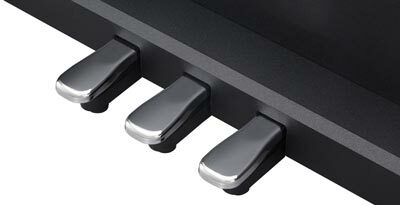 The RP-102’s keyboard can boast some impressive technology, which is normally found in higher priced instruments. 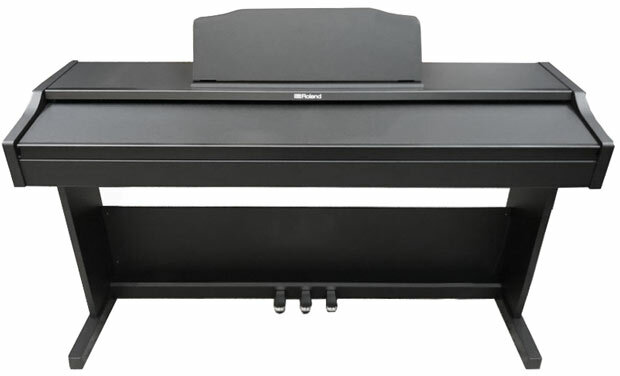 In particular, the PHA-4 keyboard uses 3-sensor detection system designed to capture each key press and interpret fast note sequences more accurately. It’s definitely a nice thing to have, but the difference isn’t always that noticeable compared to good 2-sensor actions (like Kawai’s RHC or Yamaha’s GHS), which handle fast note repetitions just fine. Escapement mechanism is another feature of the PHA-4, which simulates the subtle clicking sensation felt on a grand piano when you press a key about half way down. 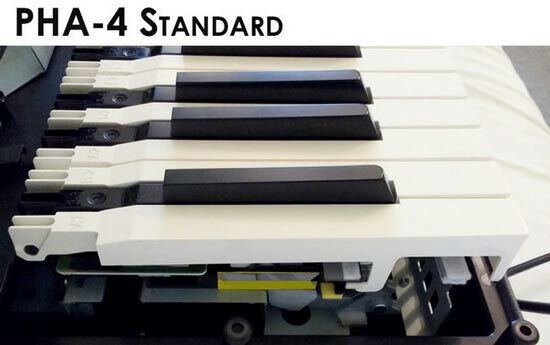 When it comes to the surface of the keys, the PHA-4 provides a lovely Ivory simulated material on top of the white keys instead of plain smooth plastic surfaces that can be quite slippy on hot days. It’s also worth mentioning that the main improvement over the previous (3rd) generation of Roland’s actions, the PHA-4 actions have become very quiet and produce very subtle clicking noise compared to some slightly noisier keyboards (Casio, Kawai). You’ve probably heard of Roland’s proprietary SuperNATURAL sound modeling technology, haven’t you? If not, it’s a system of modeling algorithms that simulates the behavior of an acoustic piano (interaction of its thousands of elements) and recreates the sound from scratch rather than simply play back the sound (samples) previously recorded from an acoustic piano. 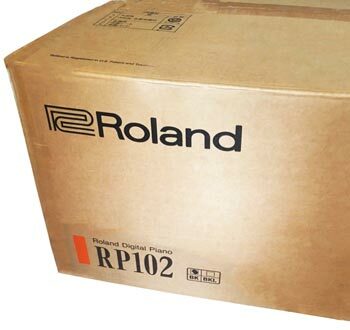 Keep in mind, that although the RP-102 features the SuperNATURAL sound engine, it uses samples (just like the majority of digital pianos do nowadays) and doesn’t offer any modeled sounds, which are available in Roland’s flagship models like the FP-90, HP-603, etc. Nevertheless, the RP-102 uses some sophisticated modeling algorithms to add certain elements to the “raw” sound recorded from a 9-foot grand piano to make it more realistic and live. 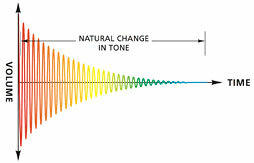 These elements include string resonance, damper resonance, and key off simulation, which are integral components of piano sound. The RP-102 doesn’t have many instrument sounds onboard, and is mainly designed to be played as a piano. There’re 4 different piano tones sampled from a concert grand piano. I believe they’re recorded from the same piano and after some magic happening during the post-recording, they were turned into 4 different tones (Concert, Ballad, Mellow, Bright). The main Concert Grand piano tone is probably the one you’ll use most often. It has a distinct character and provides a very rich, resonate sound complete with natural resonances found in a real piano. As some have noted the tone is quite bright, which sometimes get to the stage where it sounds almost percussive, but to me, that’s quite an exaggeration. First of all there are four different piano tones for your to choose from. Plus, you can always adjust the brightness of the sound within -10 – 10 range using the “Brightness” setting. Overall, I’m more than pleased with the sound of the RP-102, which can actually blow most its competitors out of the water. The sound system of the RP-102 is nothing exceptional but does its job. There are two 12 cm speakers (2 x 6W), located on either side of the piano. The speakers have enough juice to fill a living room and allow you to experience the fairly good degree of realism. For self-monitoring or performing in small to medium-sized spaces, you wouldn’t need anything else, though a good set of exetrnal speakers will allow you to get the most out of the RP-102 in terms of sound quality and volume, especially if you’re going to perform at a hall in front of many people. I was actually a bit surprised that Roland decided to equip the RP-102 with such a (relatively) low-power speakers. Nevertheless, more power doesn’t necessarily make the sound much louder or better. It’s the quality of the speakers that matters. At the same time, pianos with more powerful speakers tend to sound fuller and more rounded thanks to more wattage capacity. 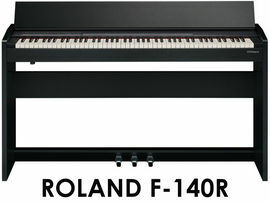 For example, the similar priced Roland F-140R, which has two 12W speakers, does sound a bit bigger and richer, even though they share the same sound engine. The RP-102 is fairly light on features and offers a bare minimum of what an intermediate player may need. 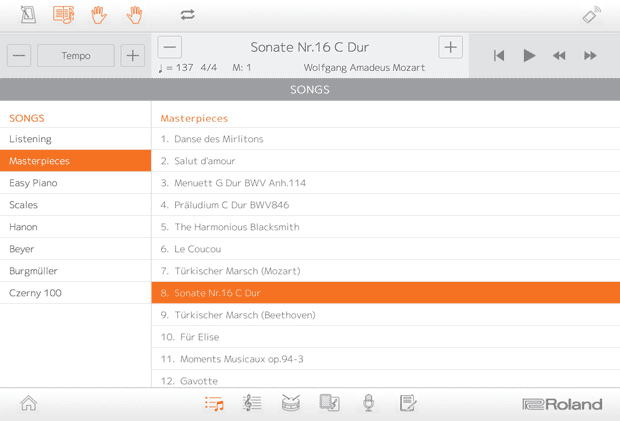 The good news is that you can easily expand the number of digital features by using Roland’s free app for iOS and Android devices called Piano Partner 2, which pretty much compensates for all the lacking features (see ‘Connectivity’ section). I find this approach quite reasonable as it allowed Roland engineers to keep the piano simple and let players focus on the “piano playing” component. At the same time, those who want some extra stuff (e.g., recording features, rhythms, teaching games, etc.) can access that in a matter of seconds using the PP2 app. In addition to a regular “Whole” keyboard mode, there’re two other Modes that will allow you to use the keyboard more effectively. Dual Mode allows you to layer two instrument sounds and play them together whenever you press a key. Although you can’t adjust the volume balance between the tones using the piano’s controls, the Piano Partner 2 app will provide that option. Twin Piano (aka Duo Mode, Partner Mode) is another useful mode that splits the keyboard into two equal sections with identical pitch ranges. So you basically have two 44-key pianos next to each other with two middle Cs. You can use the Twin Piano function with your tutor or teacher for effective practice (two players can play the same notes at the same time). The RP-102 doesn’t have a built-in MIDI recorder, but you can still record your songs using the PP2 app. It’s also worth mentioning that the RP-102 has a pretty extensive music library with over 200 preset songs. You can play them back, play along, and use them for practice. The PP2 app will add additional functionality such as start/stop, part muting, metronome on/off, etc. A built-in metronome has an adjustable beat, tempo, and volume so you can easily choose the right settings depending on your needs. Master tuning function allows you to change the standard pitch (A440) in 0.1 Hz steps to match the pitch of another instrument or recording. Transpose function can be conveniently used to shift the pitch up and down in semitone steps. When it comes to connectivity options, the RP-102 offers all the essentials including a USB to Computer port (type B), two headphone jacks and a USB to Device port (type A). The headphone jacks have different plug types (one is 1/8” mini jack, and another one is 1/4” standard jack) so you’ll be able to connect your headphones without using any adapters regardless of which plug type they have. The USB type B port is commonly used to connect a digital piano to a computer to transfer MIDI data, which makes it possible to control various music making and teaching apps such as GarageBand, FlowKey, etc. There’re actually hundreds of apps that you can use together with the RP-102 in various fun and creative ways. Just don’t forget to purchase an A to B USB cable that doesn’t come with the piano. But first check if your device supports Bluetooth, because if it does, you can wirelessly connect the RP-102 to your smart device and take advantage of all those MIDI-compatible apps available in App Store and Google Play. 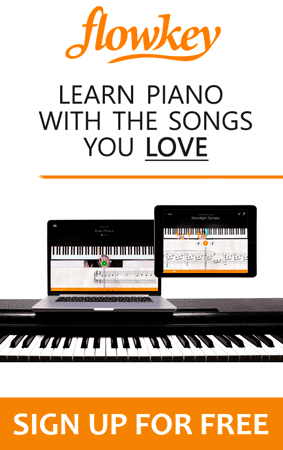 For its digital pianos, Roland has created an app called Piano Partner 2, which opens up a whole set of digital features including songs, rhythms, Flash Cards game and more. 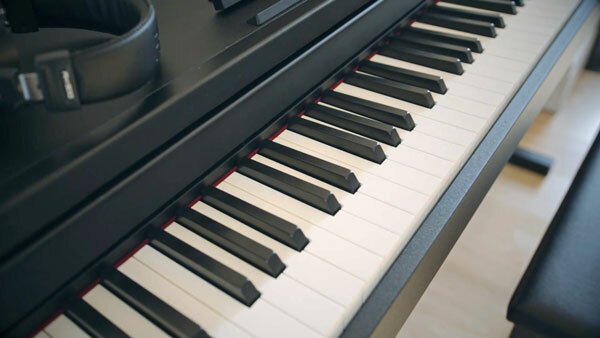 In addition, the app gives you access t0 extra sounds, Split mode, MIDI-recorder, and a bunch of other features that are not available directly from the piano. Finally, PP2 provides access to all of the RP-102’s functions and settings via an intuitive and easy-to-use interface. 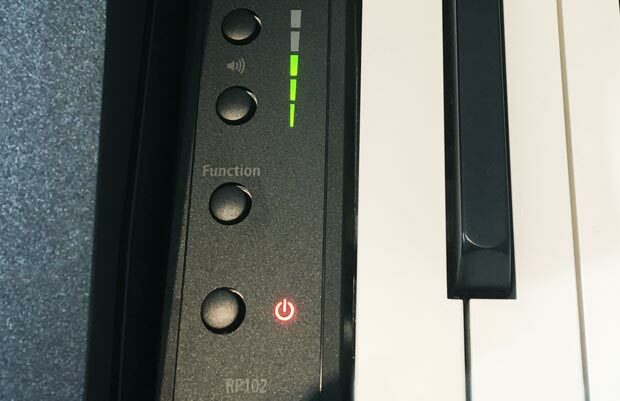 Keep in mind that the USB type A port, which is also called update port on the RP-102, can only be used to do firmware updates and cannot be used to play songs from a USB drive. 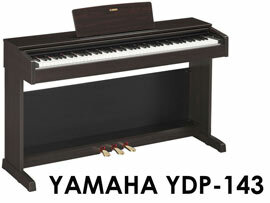 Since the RP-102 is a console digital piano, it comes with pretty much everything you need to start playing right away. It includes an integral stand, a 3-pedal unit, a keyboard cover, so you don’t need to buy any of those separately. The only accessories you may want to consider purchasing separately are a bench (you need to sit on something, right? :) and a pair of good quality headphones. It gets a little bit more complicated when it comes to choosing the right headphones for your instrument. At this price point, the Roland RP-102 is definitely one of my favorite instruments I’ve played so far. In fact, a friend of mine who works as a salesman in one of the local music stores in Bruges told me that a lot of people end up liking the RP-102 more than other digital pianos in this price range after having played them side by side. The RP-102 wasn’t a totally new model to me since it’s basically a cabinet version of the hugely popular Roland FP-30, which I’m well familiar with. The pianos share the same keyboard and the same sound engine, so they’re pretty much identical when it comes to piano playing. The only difference is that the FP-30 offers slightly more features (rhythms, MIDI-recorder) and has more powerful speakers. As for the lack of extra features, the PP2 app solves that problem at once, so it’s hardly a deal breaker. However, you might still want to consider the FP-30 , especially if you don’t necessarily need a furniture cabinet design and have a tight budget (the FP-30 cost considerably less than the RP-102). Though it’s also important to remember that if you go for the FP-30, you’ll probably need to separately buy a stand and pedals, which can cost you another $50-200 depending on the type of stand and pedals you choose (furniture style or X style, single pedal or triple pedal board). 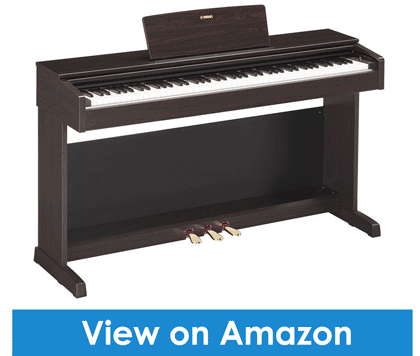 Ultimately, it just comes down to the type of piano you’re looking for: a portable gig-friendly keyboard or a home digital piano housed in a sleek, traditional looking cabinet. Feel free to leave your comments in the section down below. I’d love to know what you think about the new RP102 and its main competitors. 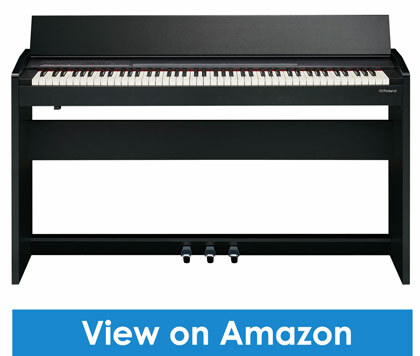 Do you have your favorite digital piano in the sub $1000 category? Hi. Thanks for the review. 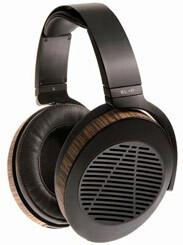 I am hesitant between the f140 and the rp102, merely on aesthetics and sound power. However, i believe there is a big difference between these two and the f30: as far as I understand, PP2 on f30 has fewer features – it DOES NOT unlock multiple voices, does not record, and does not have the diary practice log function. For that reason I am considering buying the f30. Maybe you can check if this difference applies to other markets and edit the review accordingly, because you make the case that the f30 is equivalent to the rp102 and I think that they hold different values because of PP2. Hey Vasco, thanks for your comment! Indeed, Piano Partner 2 app when used with the FP-30 doesn’t unlock additional tones as it does with the RP-102 and the F-140R pianos, BUT it does record and does have diary practice log functionality. So, at the end of the day the difference is not that huge, and for people who don’t care for extra tones, this may not be that big of a deal at all. But yeah, it’s always nice to have a bunch of different tones other than acoustic pianos to play around with. Actually, compared to its competitors, the FP-30 offers quite a good selection of built-in sounds, and those additional tones available with the PP2 app would just be a bonus, but as you pointed out you won’t be able to unlock those with the FP-30 (only the RP-102 and the F-140R). I had a typo in my comment above. I meant “For that reason I am considering NOT buying the fp30”. PP2 is a veey convenient app and its implemmentation on the rp102 ans f140 is top-notch while in the f30 it lacks some features. Moreover I wrote f30 throughout the comment when obviously I meant fp30. Sorry for that. 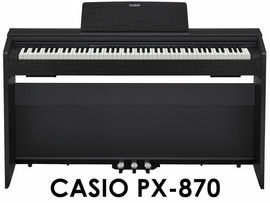 Hi Lucas, what do you think between Rloand RP102 and Casio Px870 in term of sound?